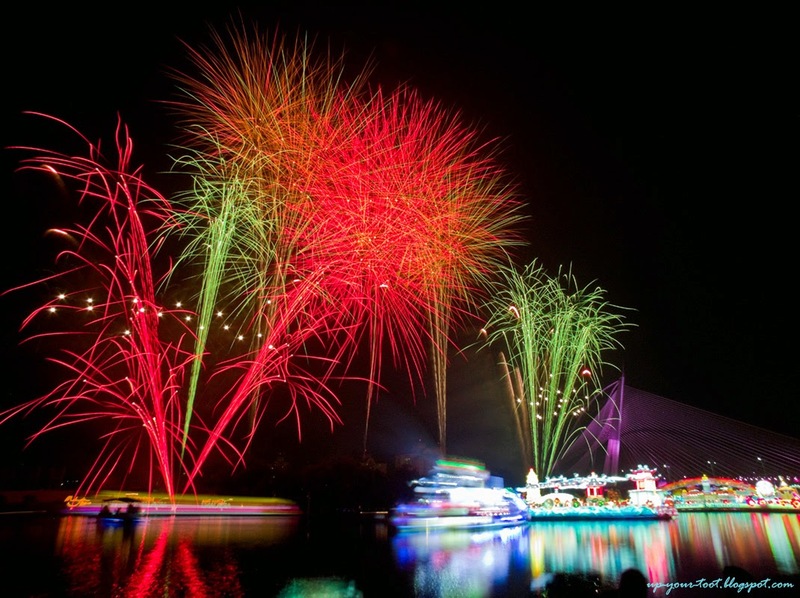 Despite the current haze situation, and API readings of above 100, Floria 2013 is 'business as usual' at Putrajaya. I made a customary visit on the first day, as this is usually the best day to view the flowers especially the indoor displays. So here are some photos for the event. 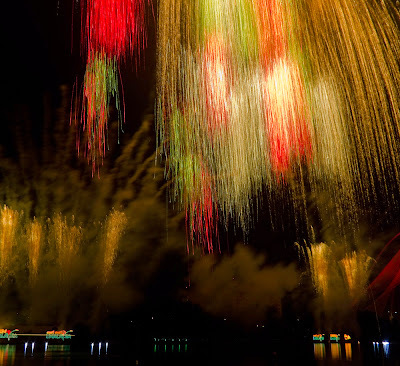 Fireworks from the 1Malaysia International Tourism Night Floral Parade - Colours of Harmony. 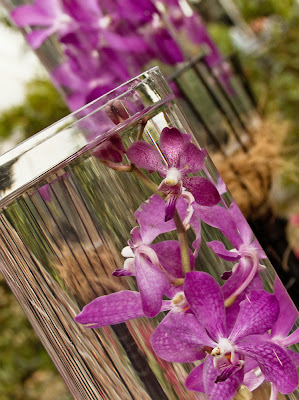 Aranda orchids in water at the outdoor display. A good way of using orchids. 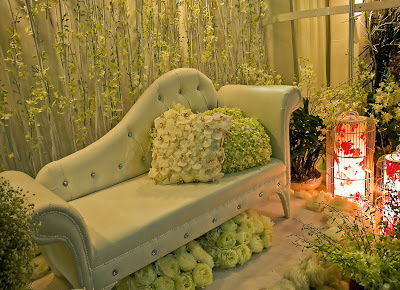 One of the flower arrangements in the indoor display area. A lovely couch with white Phalaenopsis and Dendrobium orchid pillows. 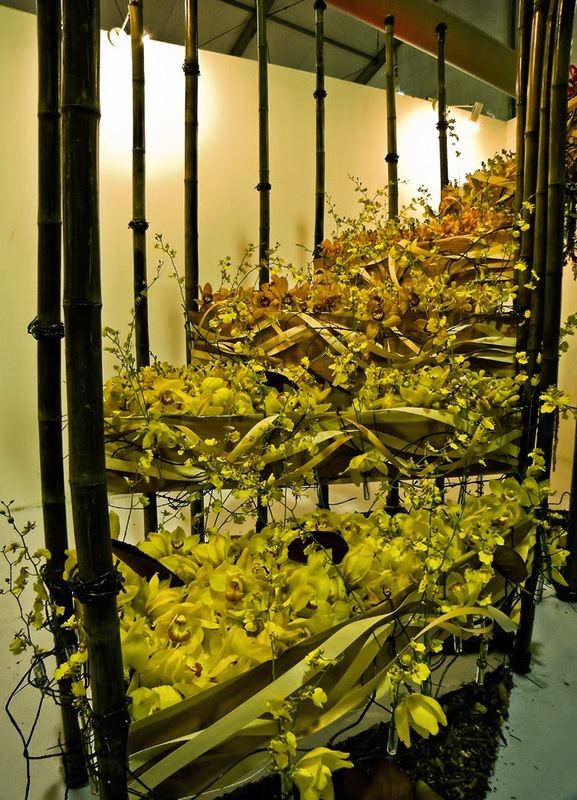 Stairway to Orchid Heaven?? 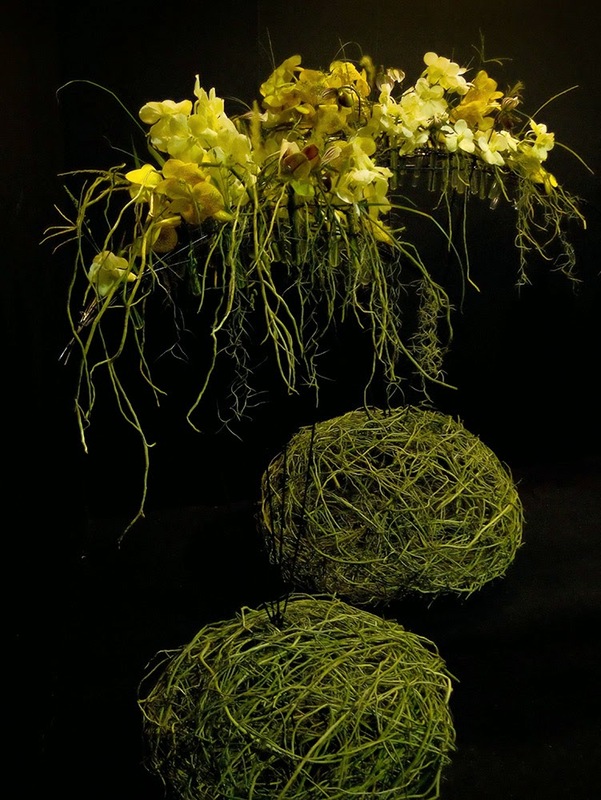 A beautiful display made with Cymbidium and Oncidium blooms. 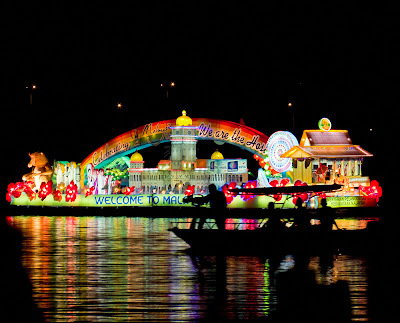 Night time transformed the area into a wonderful display of lights and of course, the very much awaited Magic of the Night Floral Parade on the lake with the fireworks display that accompanies the parade. The garden displays along the path to Menara Alaf Baru - beautifully lighted. The show about to start. Our dear minister was late and we were all getting fidgety waiting for him to arrive and officiate the event. Balls of fire - Fireworks during the parade. Another long exposure shot of the fireworks display. 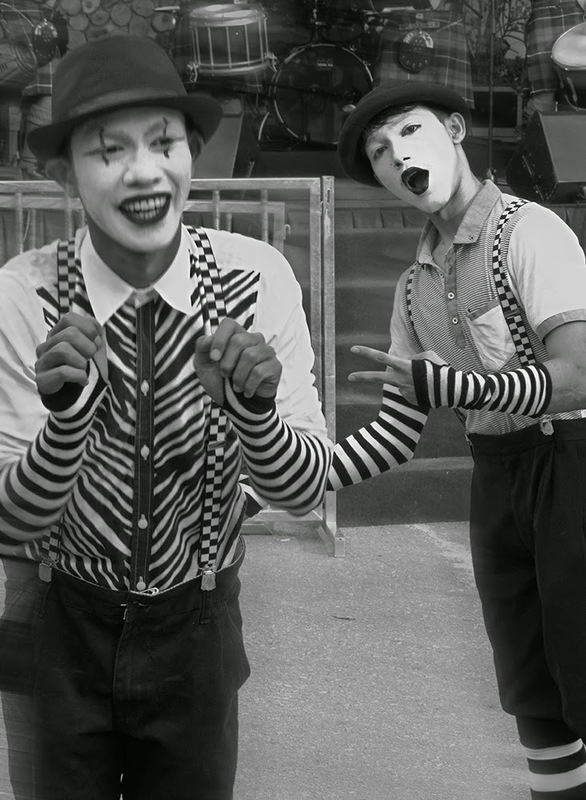 There were also mimes and performances on the various stages and exhibits throughout the day. 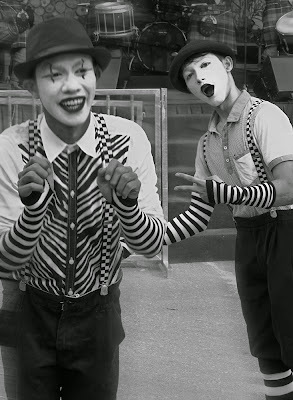 Though the mimes might be a little 'weird' to some, they were really good at getting people to take photos with them and were most willing to pose for any camera. I have taken sooo many shots that I even need to ask a friendly stall owner to allow me to recharge my camera battery to ensure that I don't run out of juice for the fireworks display. I must admit, after putting the battery to charge, I shamelessly excused myself to chat with the other sellers that I know from the various flower shows and fairs. So to negate the feeling of guilt, I will give her a mention in here - she is there selling roses and her stall is pretty strategic. 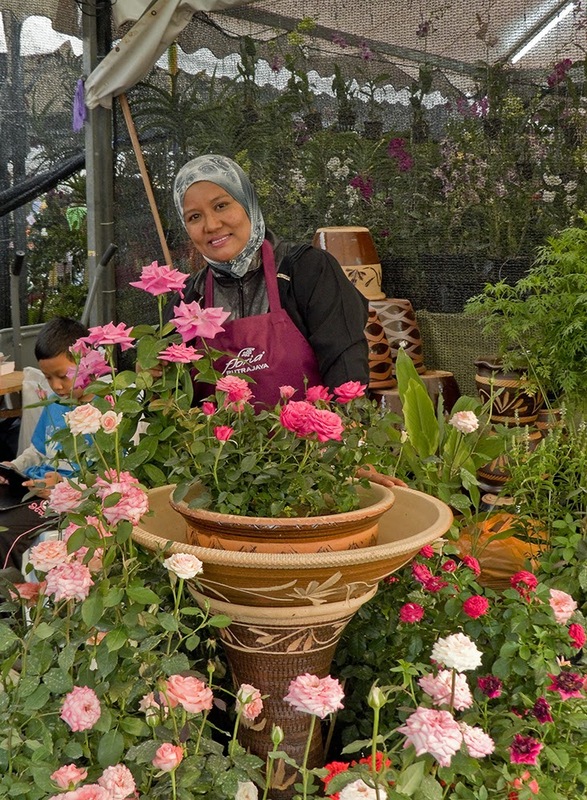 Kak Ima and her lovely roses. Thanks Kak Ima, lain kali I datang charge bateri lagi, OK? Hehe! What is new and good this year is the stalls across the roads have been given a tentage, which allows people to eat comfortably whilst seated instead of the rows of stalls in the open. Prices were not too dear, though food quality is quite variable. So do come to Floria 2013 if you have the time and the API isn't that bad. Will post more photos as I process them. Should go learn about orchids for someone like me tak tau sangat. But so tempting and dangerous for the broken wallet hehehe. ..
Fireworks everynight ke ? Might appease the children after a hot day. Kalau tak sampai this year its OK. I very much look forward to your photos sampai kena charge kat sana hehehe. ..
Oh ya orchid yang you help ID the pink one memang flower stalk dia panjang 70cm ada kut. Yes fireworks every night. Just went again tonight to take photo from another angle. 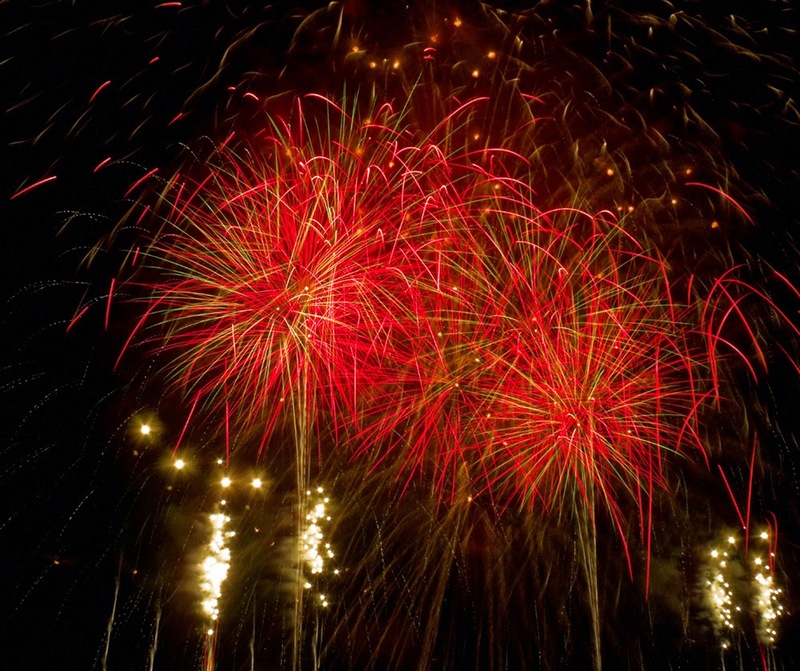 The event starts after Isyak prayers, and the fireworks is the last part. There is are two stall that is selling the curly pink orchid. I tengok clean up after je sebab kebetulan kena pergi JPN sana. Thank you for the garlic vine ID. Yup sure smell like garlic. Wonder if I can have a second opinion on the crinum;). Thanks once again for helping out with the Louisiana Iris, its always hard to agak agak from katakana compare to hiragana and kanji. Sean... lama tak up sini .. K Mar pun baru perasan entry ni... due to the haze kut..he he .. sampai bila ni? hai tak pernah dapat datang sini... mesti seronok flowers and plants around us... Ima tu one of my FB friend..
Agak sibuk kebelangkang ini. Sampai Ahad ini. Kak Mar tak pergi lagi? Pergilah lawat Kak Ima, lokasi gerai sangat strategik. 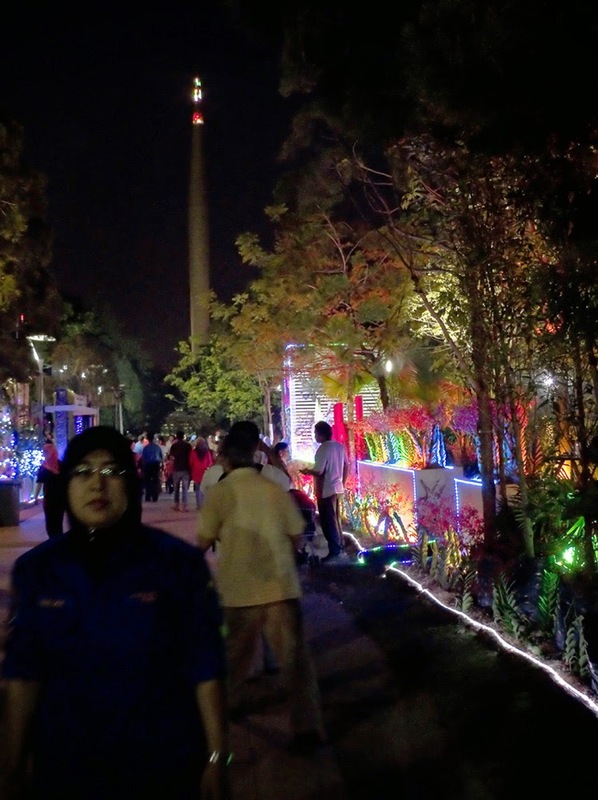 Actually I am quite disappointed with Floria 2013. I can't read the handwritten labels on the orchids. I didn't get to see which orchids is named after which famous people. I saw lots of orchids scattered everywhere. Sigh. 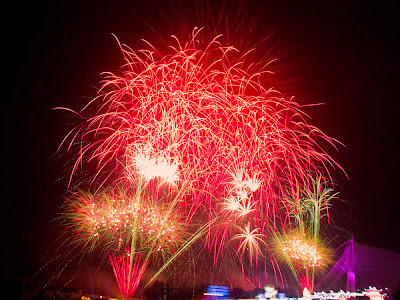 I love the colourful photos you took of the fireworks display at night. Now I look forward to your next postings about Floria 2013 orchids. I guess I can learn more from you this way. I think you hit the nail on the head regarding Floria 2013. The displays were just...displays. And the orchid display area wasn't arranged well, unlike in MAHA or Shah Alam orchid exhibition. To be honest, I took more of the floral arrangements and other flowers (and the fireworks) as the orchids just lacked ooomph! No spectacular species or hybrids. Even the sellers were not selling top quality, head turning orchids. On the other hand, the RM3000 Adeniums were superb specimens.